Journey Charms, by JJ DiGeronimo, president of Purposeful Woman and Tech Savvy Women. Journey Charms is the first in a network of sites built for JJ DiGeronimo, president of Purposeful Woman and Tech Savvy Women. JJ is a professional speaker, author and a leader in efforts to empower women in all areas of STEM (science, technology, engineering and math). She came to us wanting to start a relationship with a design company that could understand her vision, values, priorities, personality and brand. 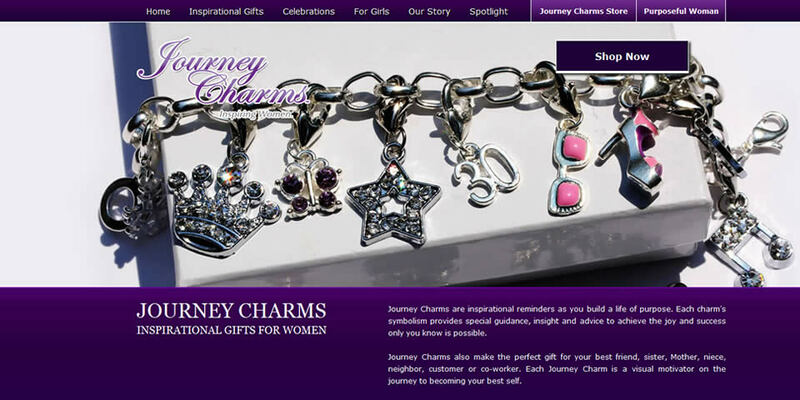 Journey Charms is a basic eCommerce site designed to market JJ’s inspirational jewelry line and publications to keynote audiences and workshop participants. Her charms are uniquely tailored to women, mothers, daughters, teens and children, and serve as a daily reminder to live a life of purpose.